Christmas is a time of caring and sharing. Christmas is when we try to do something special for those in need or less fortunate. Christmas is also the time when we remember that God gave us His greatest gift: Jesus! 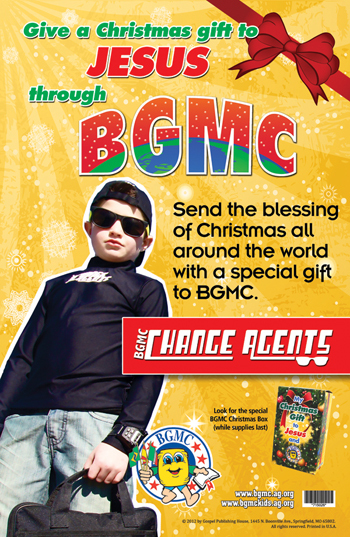 We’re challenging kids and adults to give a special gift this Christmas in the form of a special BGMC offering for missions. Your BGMC gift goes to help our missionaries with whatever they need to reach people with the gospel and to help those in need with food, water, clothing, shelter, and God’s love. We have created special BGMC Christmas Offering Boxes in English (715-025) and Spanish (715-125). To help promote this Christmas challenge, we’ve also created special Christmas posters in English (715-026) and Spanish (715-124). (These items are FREE for churches who participate in BGMC.) You can order these resources by calling My Healthy Church at 1-855-642-2011. For this challenge, we will also have clipart and images available to download. Give each child a Christmas offering box and have them tell their family and friends that they are collecting money for a special BGMC Christmas offering for missions. Have them make a list of people who might have chores they can do to earn money. Then ask them. Set up a table and wrap Christmas gifts for a donation. Everyone can do something, and when we all do something, then missionaries and people are blessed all over the world! What will your special Christmas gift to Jesus be this year?